Segment products and variations by their stock status and count. 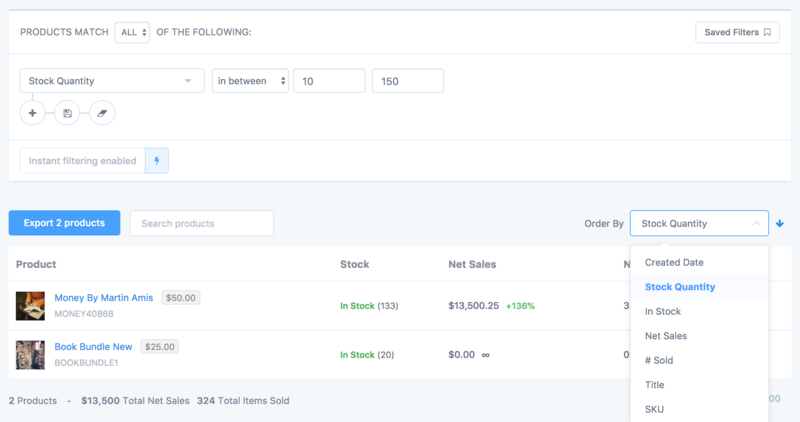 Order products by the stock status and count. Export products and variations with their respective stock statuses and counts (automatically, so for example you could get an email every day with all of products/variations that have a stock count under 5). See the stock status and count when looking at products/variations in Metorik. When a new order is received or a product is updated, your store sends a webhook to Metorik that tells it the stock has changed. Metorik then retrieves and stores the latest stock count. If you've disabled Metorik's webhooks or they fail to send, Metorik has a backup method that checks for any products that are 'out of date', so it can automatically get the latest stock counts within 15 minutes of them changing. Unfortunately, WooCommerce versions up until 3.3 have a bug that stops Metorik being able to do this. As of WooCommerce 3.3 (January 2018), this has been fixed, so if you find your stock counts aren't in sync - be sure to update or contact us so we can check for you.